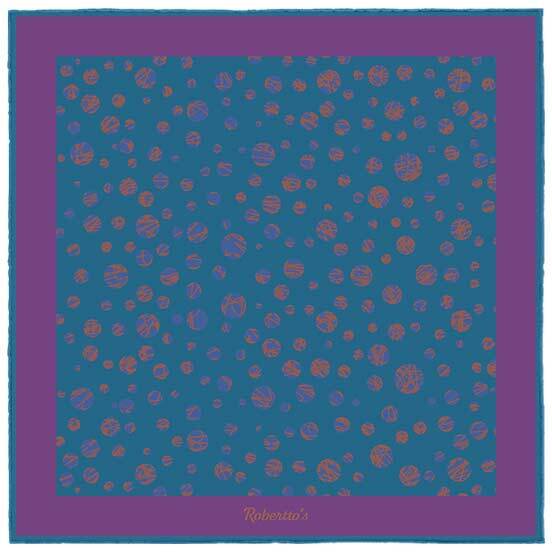 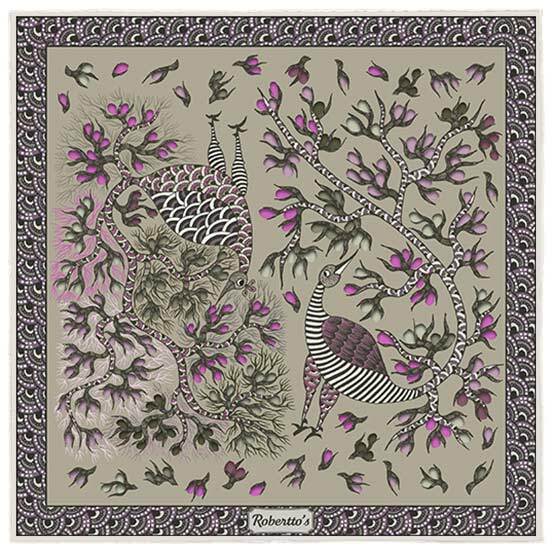 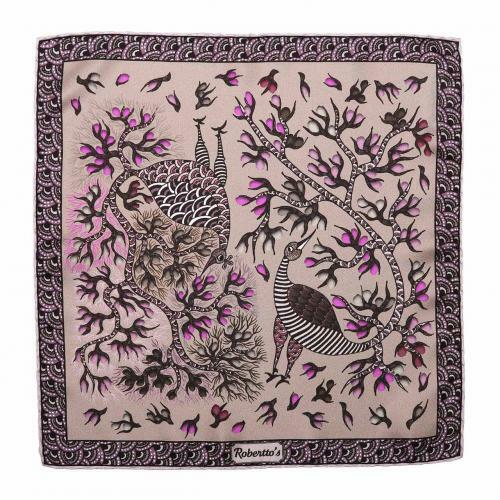 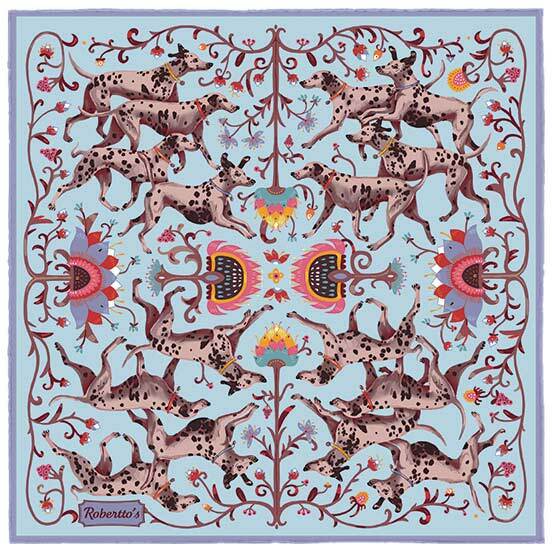 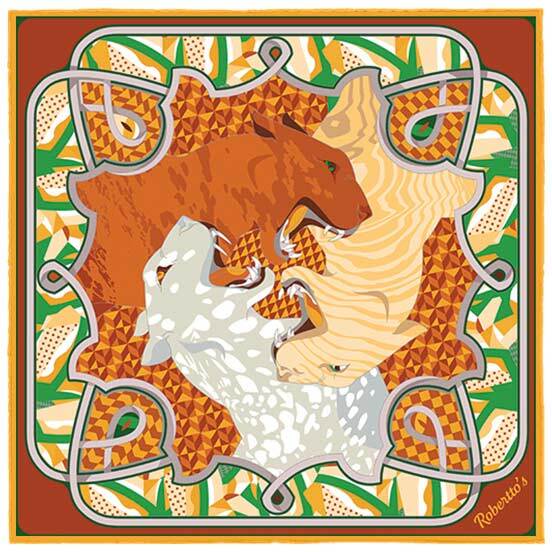 Blending the surreal with the sublime, and the timeless with the contemporary, this elegant and beautifully made pocket square is one of wonderful contradictions. The principal design takes its inspiration from the ancient paintings of the Gonds, one of India’s most distinctive and eye-catching artistic cultures. 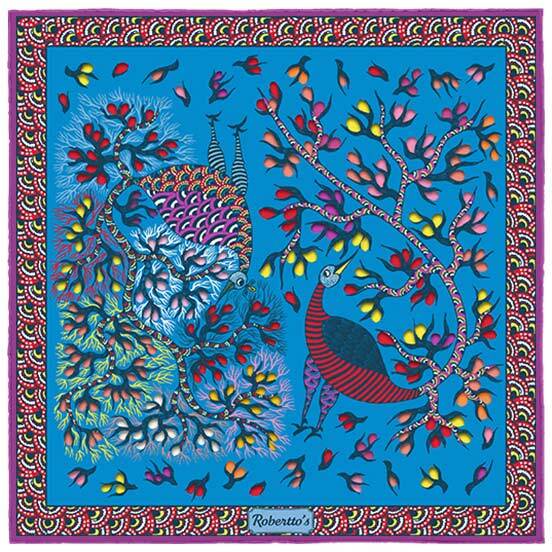 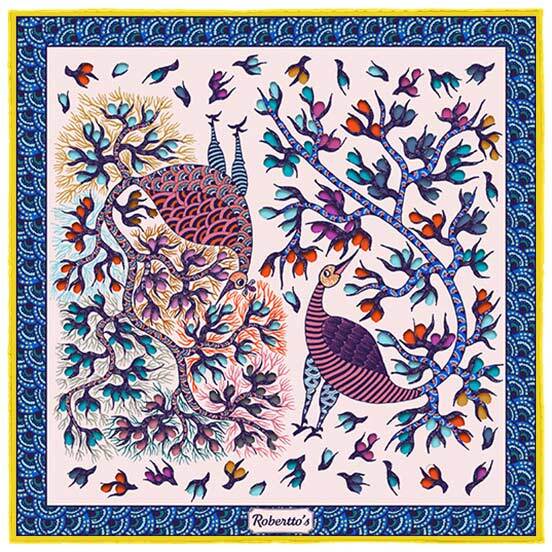 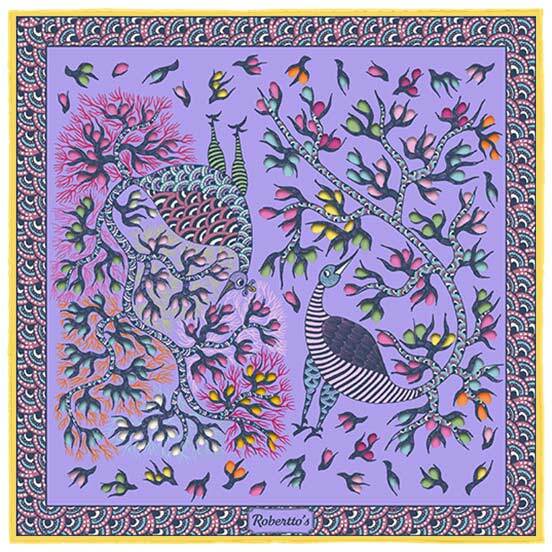 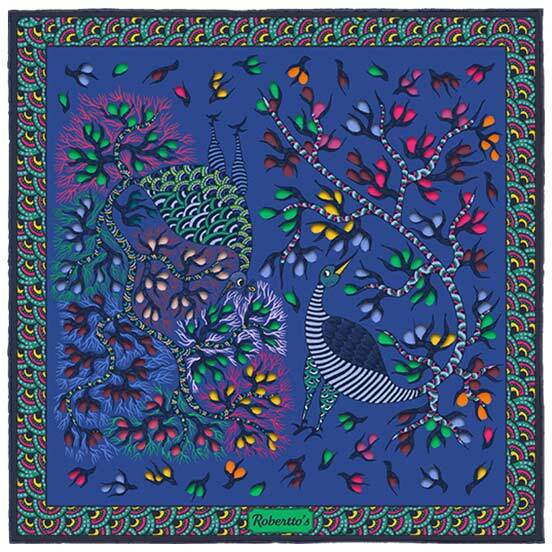 On this particular pocket square, we see two birds, whose tails are opening to reveal a pair of stylized trees, complete with leaves, branches and feathery twigs. 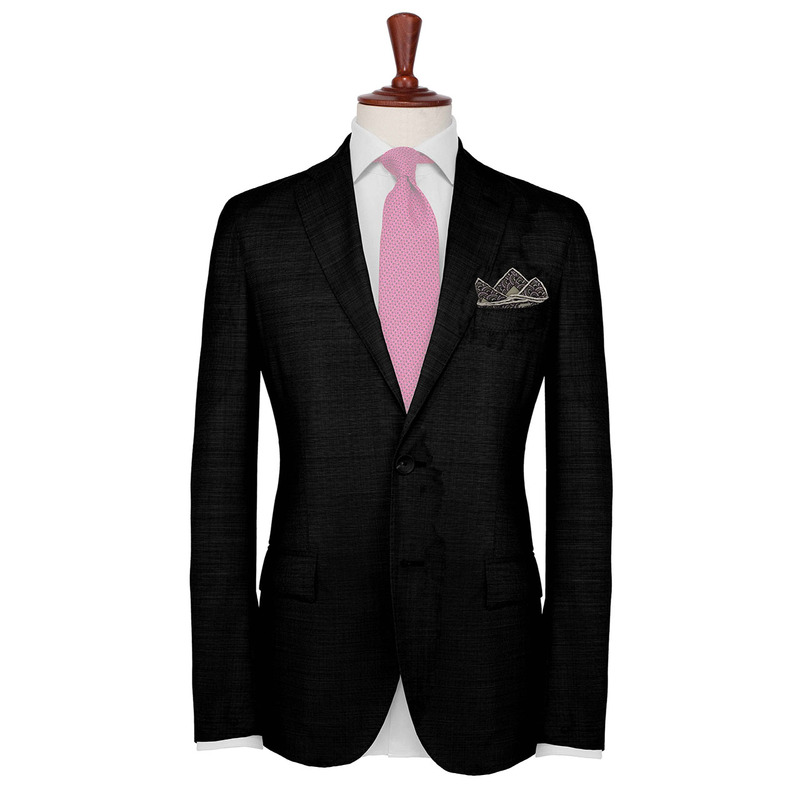 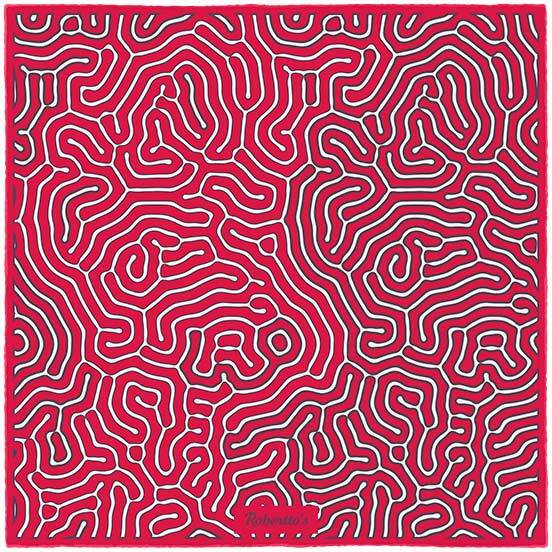 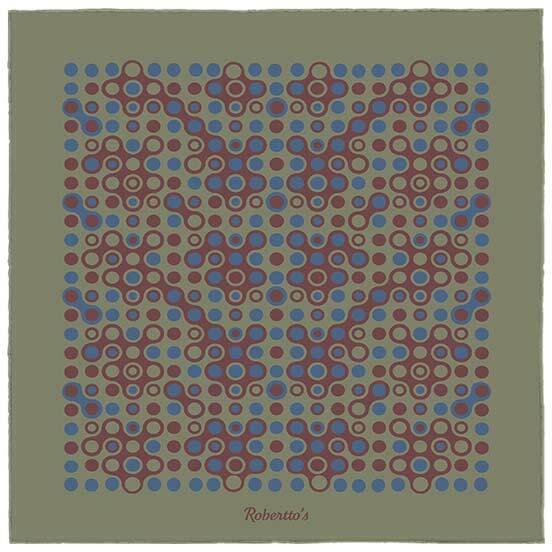 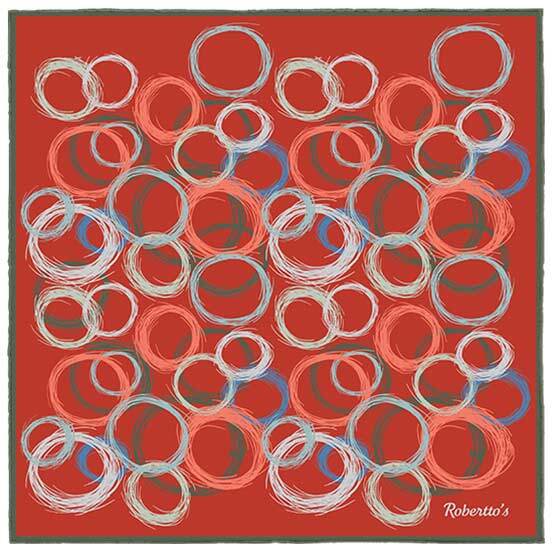 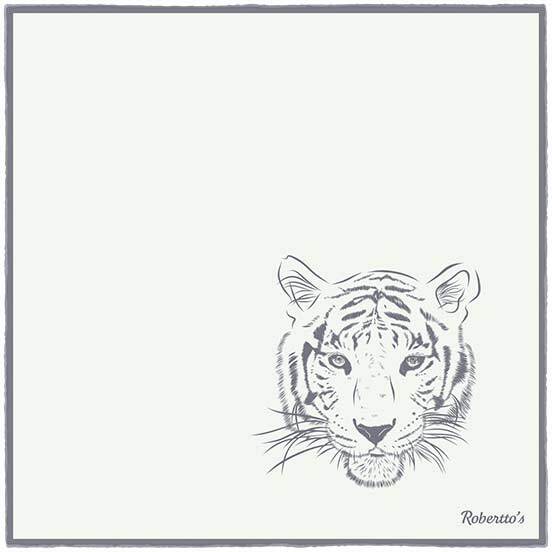 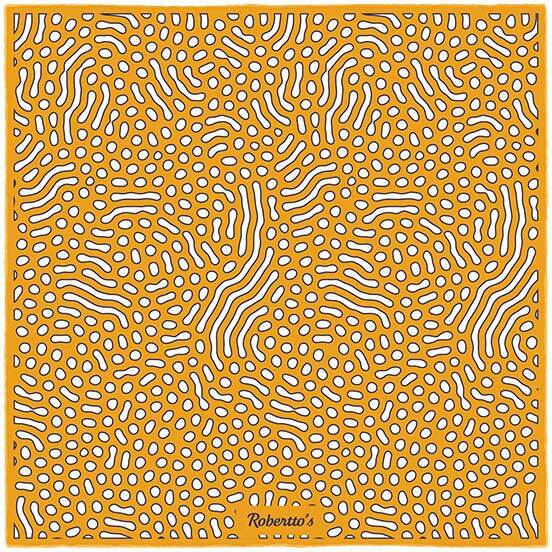 All pocket squares give their wearer the opportunity to display an aspect of their personality, through their unique designs, colors and the patterns they bear. 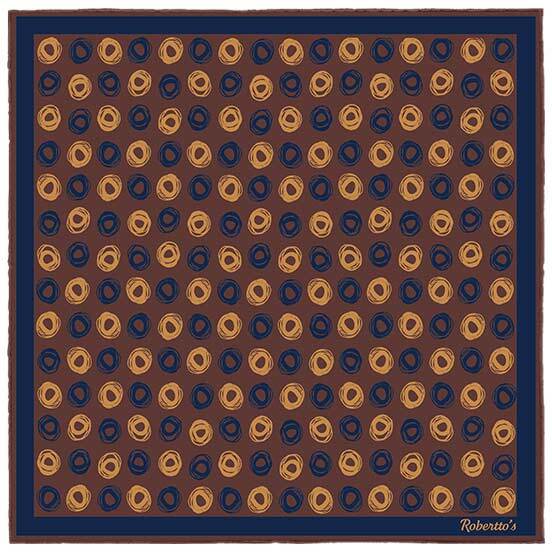 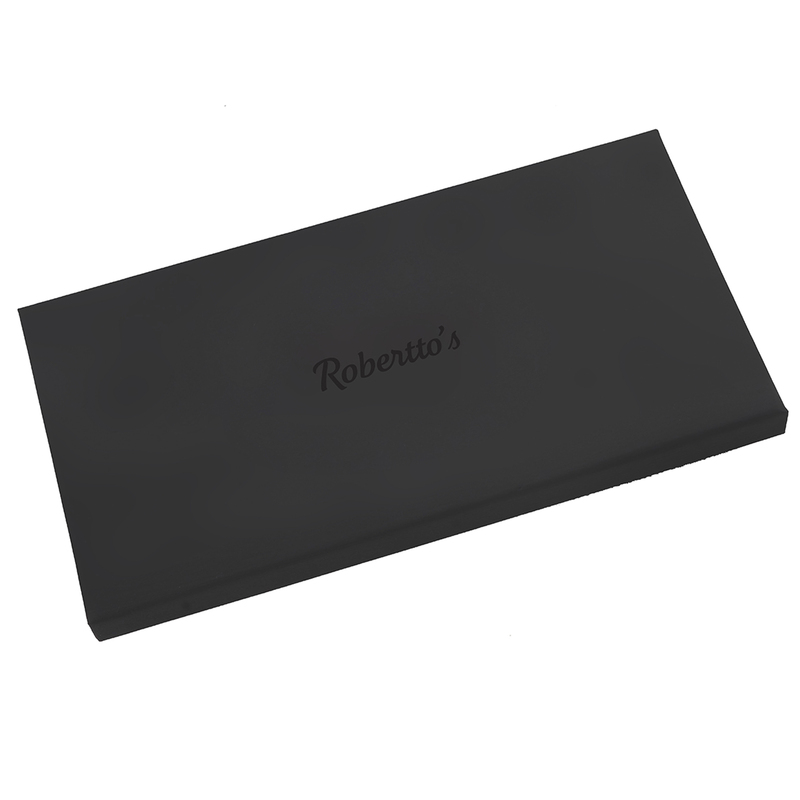 To choose this pocket square is to demonstrate your effortless sense of style and sophistication, and to show the world your ability to seamlessly blend the past with the present. 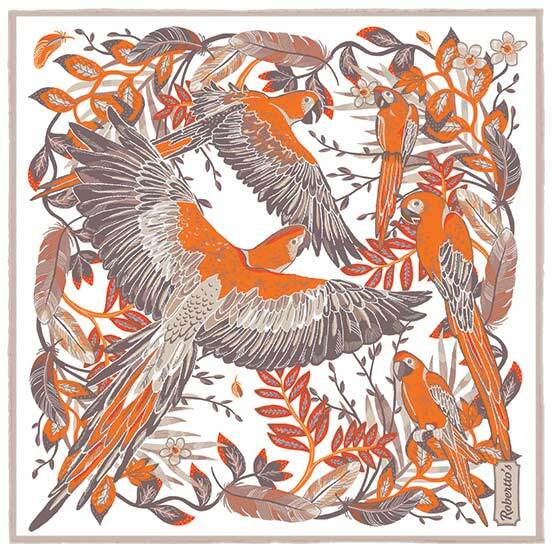 This is an accessory of ultimate elegance and nonchalance, and it provides the wearer with the attitude and bearing of the birds depicted: a sense of vitality, of assuredness of their place in the world, and of the impact they make on their surroundings. 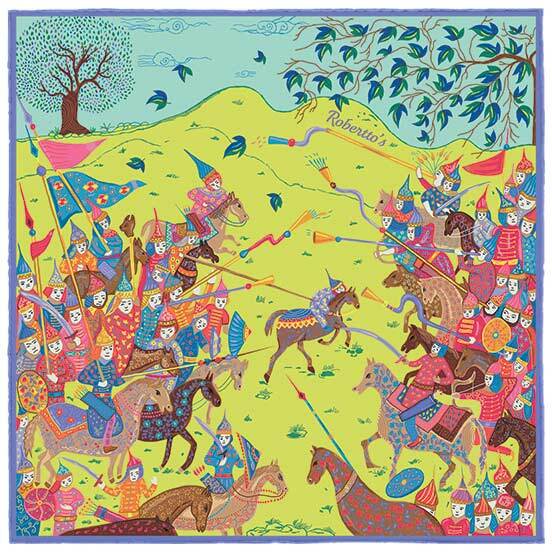 This beautifully made pocket square brings together elements of ancient artistic traditions with a flash of contemporary style. 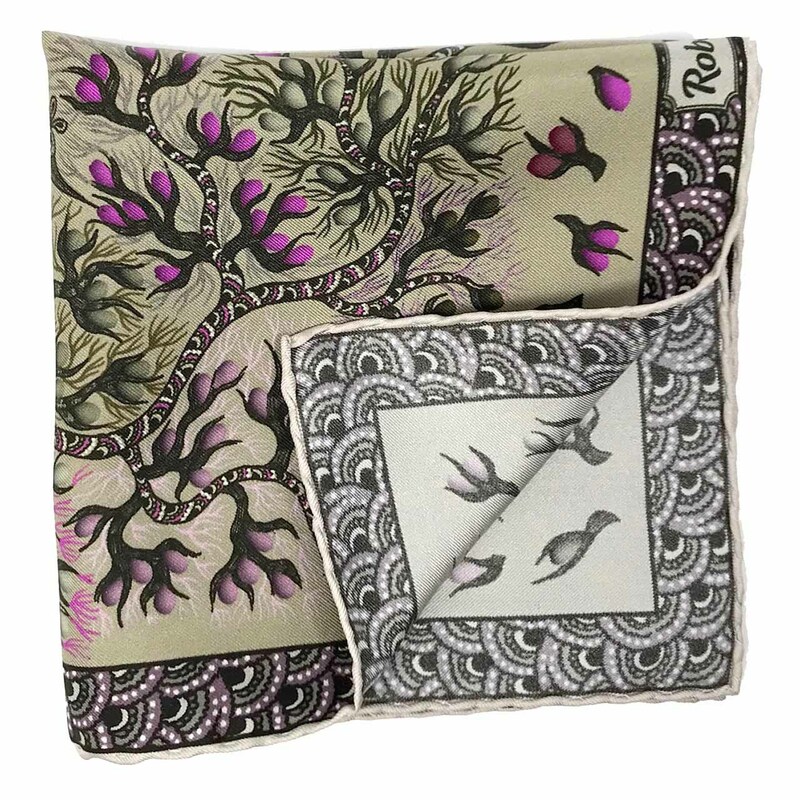 The border of monochromatic peacock feathers adds a sense of real, sharp sophistication to this delicate design – ideal for the modern individual who likes to proudly show their avant-garde fashion sense to the world. Pair this khaki and mushroom grey pocket square with a greige blazer, lavender shirt and denim jeans, for a truly memorable, effortlessly elegant effect.